The authors of the national bestsellers Mine Are Spectacular! and The Botox Diaries apply their trademark wit and wisdom to another delicious adventure. Join Hallie Lawrence Pierpont as she’s whisked away on a journey into her past love life that leads to her future. Hallie’s husband, Bill, doesn’t even wait until they get home from dropping off their youngest daughter at Yale to announce that he’s leaving Hallie. After first succumbing to an Oreo-induced coma, Hallie is determined to get her life back. An unexpected call from an old college boyfriend sets a plan in motion. Whatever happened to all those men she didn’t marry? With her best friend, Bellini Baxter, Hallie visits an all-night spray-tanning salon and Soho’s legendary Cellulite Exorcist. Her college-age children are protective of their mom but embarrassed to have her back in teenage territory–the world of dating and condoms. Finally, Hallie confronts the great love she swore she’d never see again and, while resolving an old family secret, reconciles with her long-estranged sister. Janice Kaplan and Lynn Schnurnberger tell a heartfelt and hilarious story about moving forward by looking back. 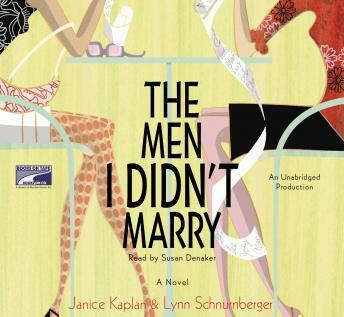 By turns poignant and laugh-aloud funny, this is a must-read for every woman who’s ever wondered about the men she didn’t marry. Excellent - laugh out loud funny!! Well read - kept you engaged the whole time.